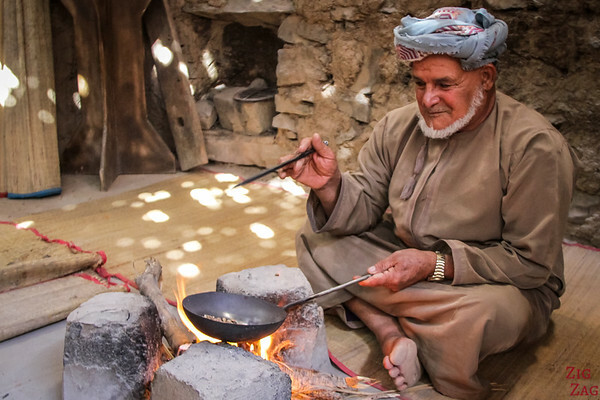 One of the highlights of a road trip through the Sultanate, is meeting the Oman people (the Omanis). They are kind, generous and happy to meet and help strangers. In this article I have gathered some stories about people I met and some portraits they allowed me to take. 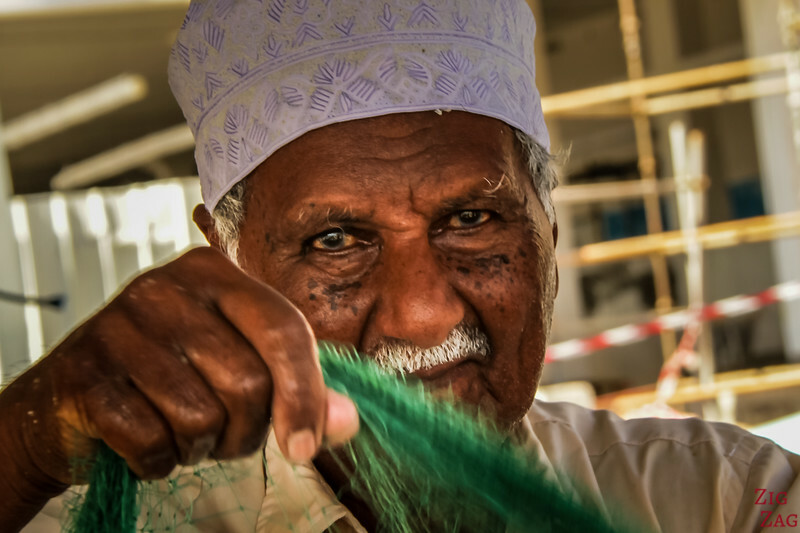 What I loved the most about the Sultanate of Oman is that it is developing while keeping tradition and culture (contrary to its neighbor) as we can see with the traditional fishing. The biggest symbol of the Omani culture is the Dhow, the traditional boat that has been used for centuries. As always respect comes first. Never take portraits of people without asking. In Oman, the people were a lot less open to photos than they were in Kyrgyzstan. When they refused I always smiled and backed away. When they accept, don't forget to show them the pictures afterwards. At the Fish Market I was able to exchange quite a lot with this man through smiles, eye contact and by showing him my pictures. With his colleagues, he was removing small fishes from a net (I am not good at recognizing fishes). He also spotted an eel in the net which can be dangerous and he swiftly threw it away. In the Fish market, after you buy your fish, you can go to another area and pay someone to prepare it. This man had one of the most interesting faces I have ever seen. His customer translated for me and he convinced him to let me take his picture while working on preparing the fish. His expert hands were moving so fast! One thing that I have not seen in other countries is that whenever we stopped on the side of the road, locals would stop and ask if we were OK and if we needed help. One time we stopped just before​ entering the sandy area of Wahiba Sands to deflate the tyre. And right away a 4WD pulled over. The owner, an Omani man, got out, took his tools in his trunk and started measuring the pressure in all our tyres to make sure we were safe! 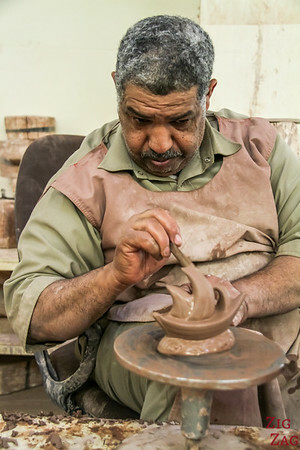 I had the chance to visit a functioning pottery factory not far from Nizwa. It was not even a tourist trap as the shop at the end did not have 'souvenir' type potteries or much to sell at all. They were mostly working for existing customers. The workers were a bit shy at the beginning (and probably intimidated by the size of my camera) but happy to show me their craft. One of my favorite meets in all my trips happened at Jabal Al Akhdar. I was admiring the ruins of the old village Wadi Bani Habib and crossed path with a group of Omani women. The oldest, all dressed in black, approached me and started asking me questions. Her English was excellent. 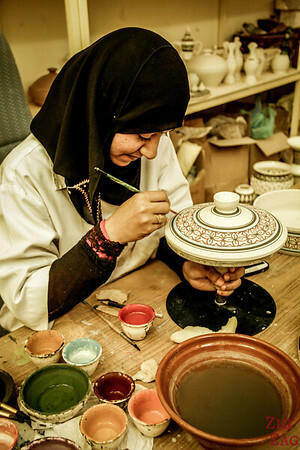 She was living in Muscat and was visiting the region to show her family around as they were originally for the area. She explained that in the 50s her family lived in a cave in those mountains. After a few minutes, as her family was waiting for her to get in the car she asked me what I thought of the Omani people. When I answered ​positively, talking about their kindness, her reaction was unforgettable. A big smile crossed her face, and with a louder voice she said: "It is thanks to the Sultan Qaboos. He told us to love everyone". 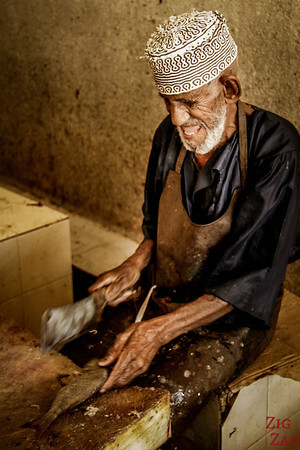 Bait Al Safah is a living museum inland Oman. 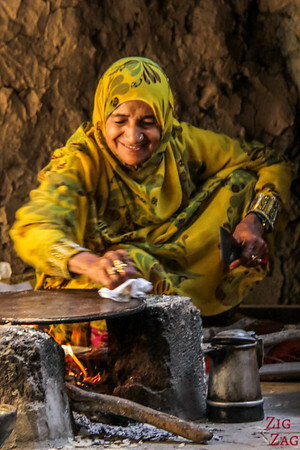 You can enter an old house that is kept decorated like old times and where you can see locals cook and craft as it used to be done. As I entered the main room was filled with chatting and laughter. It was just me, my guide and them and even though they spoke close to no english we had a great time laughing together. At Misfat Al Abriyeen I was lucky that we were only 2 guests the night I slept at the Old Misfat Guesthouse. So one of the owners sat with us during diner. We were on the rooftop terrace, surrounded by plantations and mountains, the stars were shining above us​ and he started telling us legends of the area. Perfect mood for stories! He told us legends of people from the area who had special abilities such as being able to run in the dark long distance in the mountains or able to see far away. This legends were told with long stories in special circumstances. I won't spoil them in case you get to hear them first hand at the guesthouse. He also shared about evil spirits taking the form or animals and genies believed to still live in the area. Those were quite fun! ​Towards the end of the meal, he talked to us about the magical female creature supposed to own this land and at that exact moment we heard a very loud noise coming from the plantation. We all looked around to see where it was coming from but could not spot anything. We all laughed but... who knows? 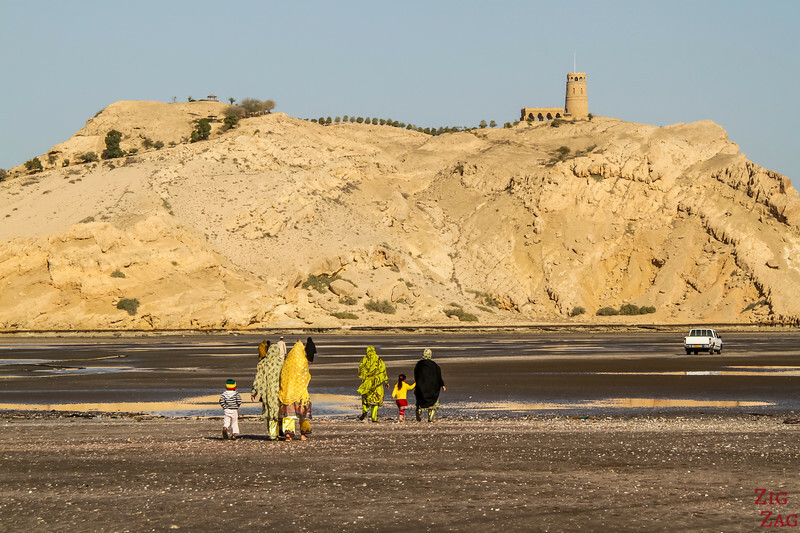 On the weekends, Oman People enjoy going to the wadis or to the beach. Here is at Al Sawadi Beach. It was low tide and some families were crossing to the island. It looks empty but it was actually really busy. Do you like portraits and stories? In which country have you found the people to be the kindest? C’est de plus en plus difficile de prendre en photos les habitants aux 4 coins du Monde. A Oman en 2007 c’était déjà difficile de les prendre en photos. 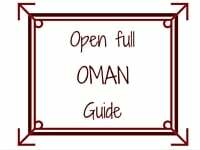 Your information is superb and so useful before we travel to Oman the forst time. 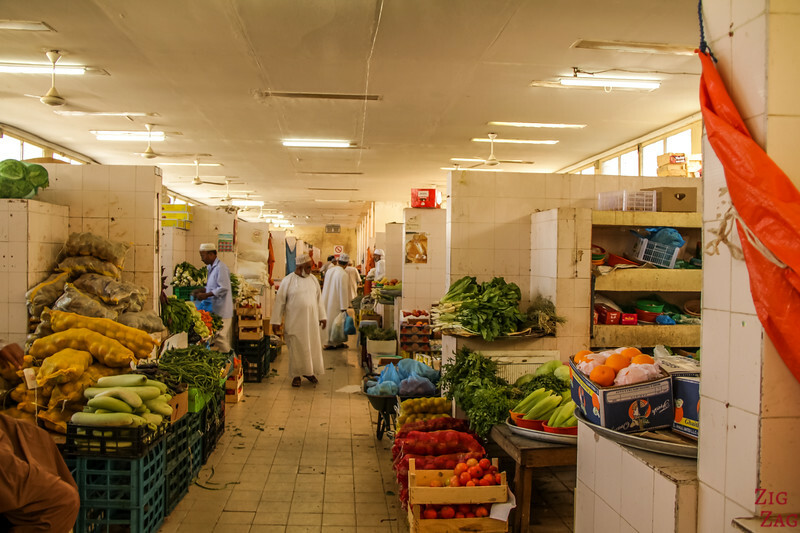 Hi Claire, l wished i discovered your blog before my trip to Oman recently, nonetheless we travelled with Valentina as well:) amd boy its truly a special nation with the friendliest locals , truly gorgeous sceneries and the freshest seafood! 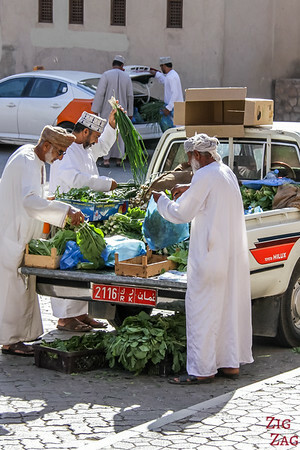 Your pictures are wonderful, and looks like Oman is slowly getting popular.